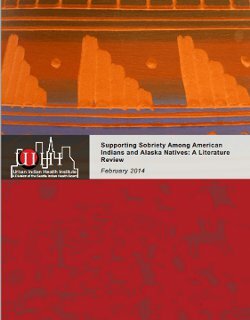 This report highlights and reviews literature, programs and activities focused on substance abuse in urban American Indian and Alaska Native communities in the U.S. In 2010 the Urban Indian Health Institute (UIHI) initiated its Health Equity Project to provide information and tools to address the health disparities affecting urban AI/AN communities. This report represents a synthesis of academic (articles in scholarly, typically peer-reviewed journals) and grey literature (from a variety of sources including websites, online documents, government reports and presentations). This combination of findings is uncommon in typical reviews of substance abuse among AI/ANs, which tend to focus on peer-reviewed academic literature. The results of this literature review identified five common themes regarding implications for addressing substance abuse among AI/ANs. These themes include (1) cultural care, (2) client-centered care, (3) skills building, (4) community-support and (5) healing traumas for recovery. Additionally, these results included program or activity descriptions. These program descriptions provided illustrations of the identified themes in practice. Lastly, the review identified resources for understanding, preventing and treating substance abuse in urban AI/AN communities. These resources are listed at the end of the Results section.